Planting vegetables requires certain practices—some of which can become a bit comical—but with hard work comes great rewards. Young Benji starts by testing the earth with a shovel. The ground is so hard, Benji topples over, along with his shovel. He perseveres. His goal: to grow the biggest banana squash ever! He’s using seeds he saved from a squash he ate last summer. Benji and his parents appear to be white, and his conversations with mom and dad help him understand how to plant his seeds, when to expect sprouts and buds, and what the family can do with the fruit and its seeds. Bright, digital illustrations that vary in size from vignette to double-page spread help set the pace as Benji waits patiently. Benji is all bigheaded cartoon wonder: his face reflects every emotion from excitement to concern to love as he watches and waits. Drawings of the plant, from sprout to blossom to fruit, are satisfyingly realistic. 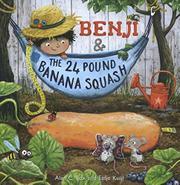 Benji is overjoyed as his squash grows and grows to 24 pounds! It’s even better cooked. This story offers one child’s particular experience of “garden to table” and may inspire other youngsters to try the same.